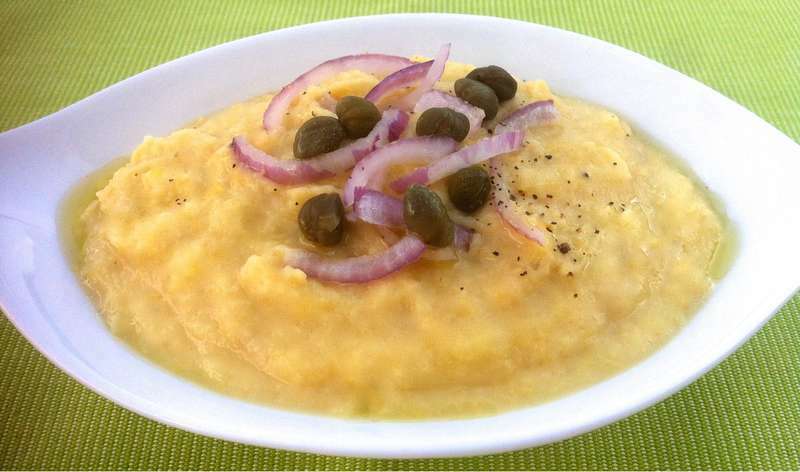 A delicious traditional veggie dish straight from the island of Santorini! Creamy and super tasty, the perfect starter for a cold winters day. If you’ve been looking for a fava recipe that actually tastes like the one served in Greece, then you have to try this authentic Greek fava recipe. Serve as a delicious appetizer or dip with a drizzle of extra virgin olive oil. Enjoy! Heat a large pot over medium-high heat; add 2-3 tbsps olive oil, the chopped onions, garlic and some fresh thyme and sauté. As soon as the onions start to caramelise add the peas and blend. Pour in the warm water and the olive oil, turn the heat down to medium and season well with salt and pepper. Simmer with the lid on for about 40-50 minutes, until the split peas are thick and mushy. While the split peas boil, some white foam will probably surface on the water. Remove the foam with a slotted spoon. When done, pour in the lemon juice and transfer the mixture in food processor. Mix, until the peas become smooth and creamy, like a puree. Serve the fava with a drizzle of olive oil, a tablespoon of diced onion and some capper or chopped parsley. Enjoy!